Thursday was an on-your-own-day and Bev and I decided to make it a wine day as the Yadkin Valley has a blooming winery industry. 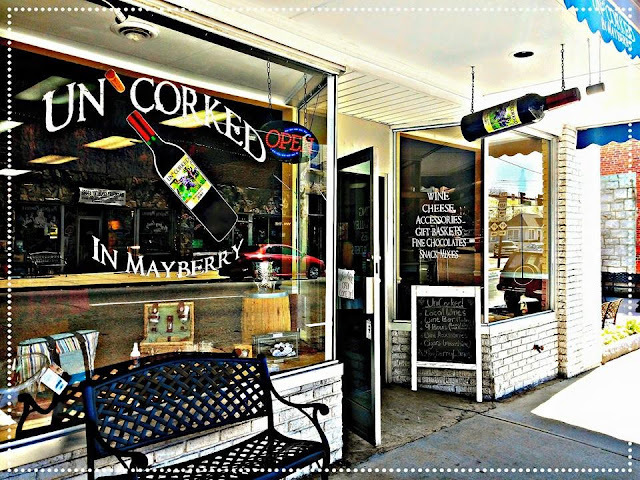 We began downtown at a wine shop called Uncorked In Mayberry, which we thought was a tasting room for multiple wineries but it turned out to be a wine shop and bar where you could buy glasses or bottles of wine from several local wineries as well as beer. Wednesday was Mt Airy day for our rally group where we spent the day downtown seeing the sites and having lunch. Like many older manufacturing towns, Mt. Airy has become a tourist destination themed around Mayberry and it seems to be prospering with lots of newer places south of town (Walmart, fast food, restaurants, car dealers, etc – most towns seem to have this area). 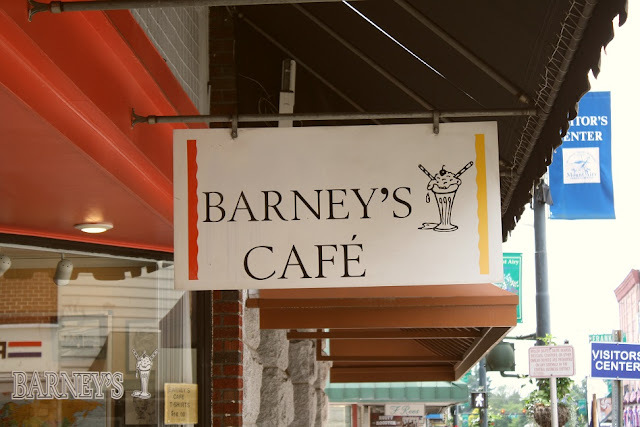 The historic downtown, basically one street and about four blocks long, also seemed to be doing well and while one place was having a “going out of business” sale, all of the buildings were occupied by a shop or restaurant, such as Barney’s café and Floyd's Barber Shop. Our chapter of FMCA held a small rally near Mt. Airy, NC and since Bev and I had both wanted to visit there at some point, we couldn’t let the opportunity go by. As usual, the rally was during the week so nothing was crowded even though it was mid-June. Mt. 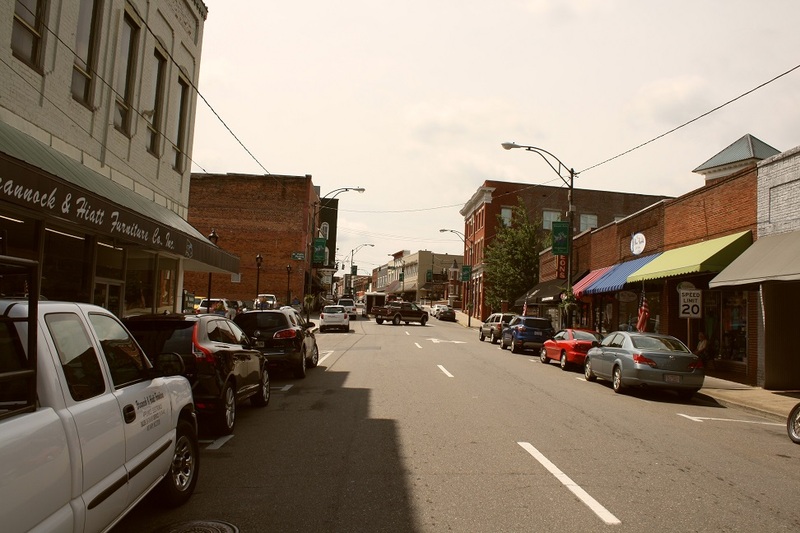 Airy is noted for being the home town of Andy Griffith and it has morphed itself into a tourist location centered around the TV town of Mayberry from the Andy Griffith Show. We had a choice of two primary routes to get there – I-40 then I-40 or I-81 then I-77 and since they were about the same distance and I’m not a big fan of the curvy I-40 through the mountains, I opted for the I-81 route knowing I would still have to go over The Blue Ridge on I-77. Traffic on all three interstates was reasonably heavy as it nearly always is but we had no delays, the road surface was generally good (except for the bridges in VA), and crossing the mountain was uneventful – it is not a steep grade. Bev had bought an eye of round roast and we decided to cook it on the rotisserie for our first cook on the new grill. 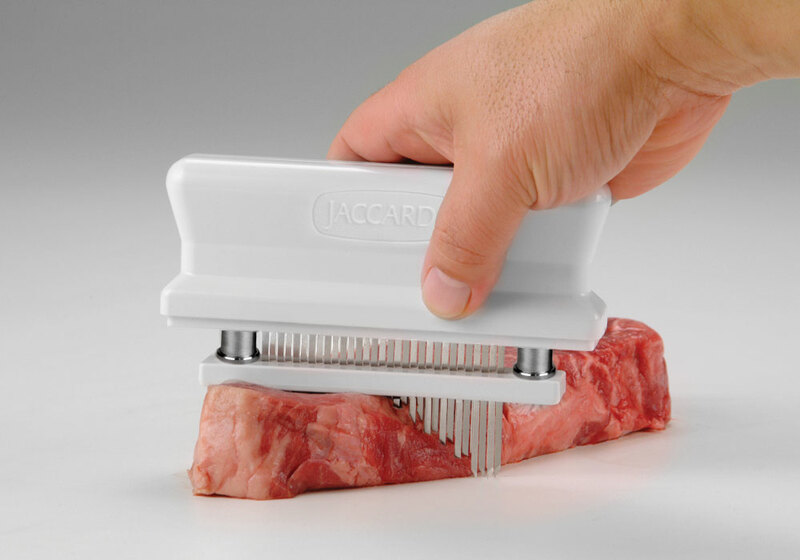 She bought it at our local Vonore store which has a real butcher shop and the roast was well trimmed but unfortunately, their beef is all select. To help with this less tender beef grade, I ran the Jaccard over the entire thing to cut some of the muscle fibers and provide an inlet for the marinade – a couple of shots from the web and a tool every kitchen should have – IMHO. 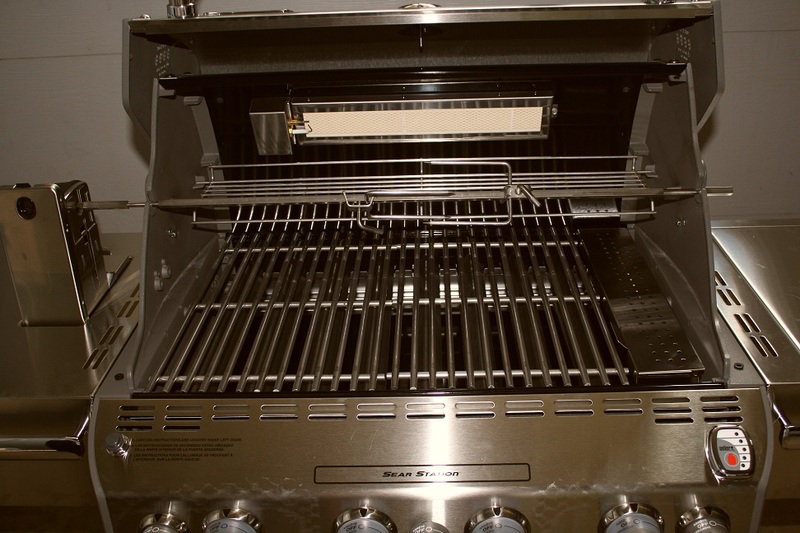 Many years ago, we bought the Home Depot version of a Ducane grill, which at the time had a reputation for making pretty high end grills. 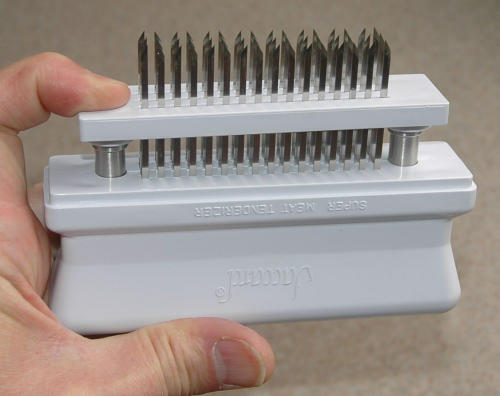 Of course some corners were cut on the Home Depot version, which was less than half the cost of the normal Ducane. We used it for at least 10 years and put new burners in it twice, but it now won’t stay lit and I’m not working on it anymore. Bev’s view on grills is buy a cheaper one, toss it when it quits working and rusts out, then buy a new one, which is what we have been doing up until now. 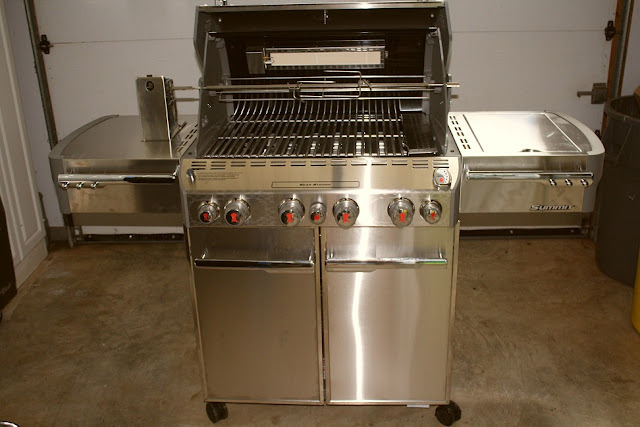 But this time, I decided to spend some of the kids inheritance and I got a Weber Summit which is not a real high-end grill but well above our normal. With the 10 year warranty on most parts, it will hopefully be the last grill we have to buy. Since I could not find this model at one of our big box stores, I bought it from Amazon for less than the list price and with no shipping cost – I’m one of those online shoppers whose behavior is unfortunately resulting is the closure of many brick and mortar stores. I had to spend about an hour installing the side shelves and a few more parts to end up with this, including many of my fingerprints. It has some bells and whistles, such as lighted burner control knobs and a lid-handle mounted light, that I don’t really need but I like that there is a place to store the rotisserie items and the motor is always installed on a flip up mount. It also has a searing area and a smoker box which will allow some bbqing without using my big smoker. I have fired it up using a normal propane bottle and now I just need to put it in place on the patio, hook it to our home’s propane system, and commence to cooking. When I got the date for the graduation of granddaughter Katelyn Roden (our oldest daughter Kathy’s child), I immediately thought in terms of an RV trip to Texas. But before making any plans, I checked with our eldest son, Rhett, about the date for Madison’s graduation and sure enough it was the day after Katelyn’s. Since Bev and I could not both be at both graduations without an airplane trip we decided that Bev would go with her sister, Pat, to Madison’s and daughter Wende agreed to go with me to Katelyn’s. Since I have developed a real aversion to the hassle of flying, Wende and I made a quick driving trip to Shertz, TX – two days down, 2 days there, and two days back and as it turned out spending four days in the car together was very good for our relationship and some DVD books made the trip pass pretty quickly. Bev and Pat had an easier six hour drive over to Sumter, SC and that was relieving for me. Both granddaughters graduated from large public schools with about 600 in each graduating class and both were in the high honors category, which I thought was excellent. 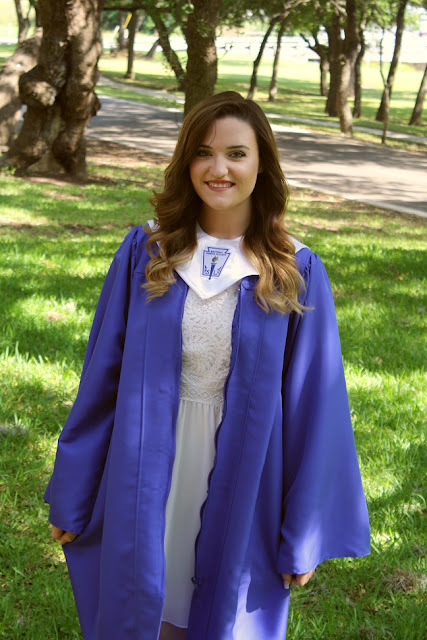 Since I went to Texas, I’ll begin with Katelyn’s graduation from Samuel Clemens High School, which may have been the best organized one I’ve attended. Here are some pre-ceremony shots of Katelyn and Kathy taken at home.